Lift Orlando, the West Lakes Business Partnership and Rally invite you to the first West Lakes Food Business Accelerator Pitch Night at Credo Conduit. The 8 food businesses that are a part of the cohort are excited to showcase what they have been working on. All are food-related businesses with a love for unique cuisine, community, and culture will pitch for an opportunity to engage investors, supporters, and new potential partnerships and restaurant goers. Hear each company’s pitch, learn about the vision of West Lakes Partnership and Lift Orlando , find out how to get involved in Lift Orlando efforts, and enjoy community and food. What companies are in the cohort? Food Trucks in the City: Food Trucks in the City is an events service that brings local artists, businesses, and food trucks together to provide a fun-filled time for the community. FTIC connects businesses to food trucks to improve employee and workplace morale, too. We have access to over 100+ food trucks and caterers in the Central Florida area that are eager to be of service. Oley’s Yummy Kitchen (aka: Oley’s Smokehouse): Oley’s has been serving amazing and yummy food since 1990. Oley’s Restaurant, is “the” neighborhood restaurant that so many residents frequent for great food and conversation. It is a popular, highly-rated, family-style dining restaurant and catering company specializing in bar-b-que, Caribbean and American flare. Nikki’s Place: Nikki’s Place has been serving up traditional flavor soul food and catering special events in Orlando, Florida since 1999. However, if you’ve never experienced the finer side of soul food, Southern Cuisine, then you must visit Nikki’s Place located less than two minutes from downtown Orlando. We know what you like and how you like it! HEBNI Nutrition: Hebni Nutrition Consultants, Inc. is a community-based, not for profit agency formed in 1995 to educate high-risk, culturally diverse populations. HEBNI’s mission is to provide culturally appropriate nutrition education and intervention strategies to prevent diet-related diseases. H.E.B.N.I. stands for Health Education through Behavioral and Nutritional Initiatives. Mercantile Coffee: Mercantile Coffee helps businesses thrive through quality coffee. They design, build, and manage beverage programs for organizations focused on offering exceptional experiences. Mercantile Coffee Co started as a nitro cold brew pop up bike at the Parramore Farmers Market in January 2018. With flavors from Nitro Thai Tea to Cereal Milk Lattes their originality, creativity, and craftsmanship shine through every drink. Orlando Coffee Roasters: Orlando Coffee Roasters was established in 2004, and our family took ownership in 2006. As an established, family-owned business, we are committed to providing our customers with the best quality coffee experience. We offer fresh roasted coffee and a diverse selection of premier and high-quality beans from different regions around the world. The great thing about being a small, family-owned business is that we treat our customers like our family; and our mission is simple: to provide the best coffee and service to our coffee family. My $.02s – I’m very impressed with the work Lift Orlando is doing to improve the West Lakes District. I love that they have engaged the community to understand their needs and help formulate their plans – very entrepreneurial approach to economic development! Did you know they did over 1,200 door to door interviews to collect information? Talk about customer discovery! Equipped with this information they have taken a strategic approach, working together with local stakeholders to advance the West Lakes Community. This involves real estate development projects, health & wellness initiatives, educational efforts, and efforts to advance local businesses through the West Lakes Business Partnership and the Food Business Accelerator. 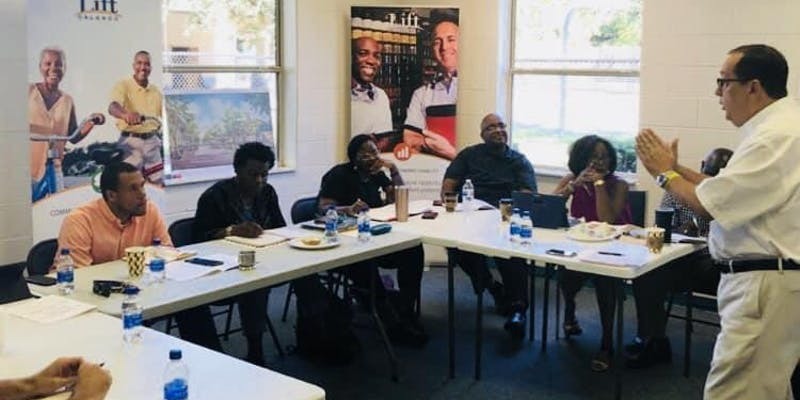 I’m honored to be a mentor to one of the companies in this year’s Food accelerator cohort and look forward to seeing the great work Lift Orlando will continue to do to advance the West Lakes community. I encourage you to attend the West Lakes Food Business Accelerator Pitch Night on Wednesday November 14th at 6:00 pm. David Brim is a marketing strategist, entrepreneur and investor living in Orlando, Florida. He is the founder of Orlando Entrepreneurs and founding partner of the Orlando Opportunity Fund. His primary professional focus areas include business model development, online lead generation, Software as a Service (SaaS) products, angel investing, and commercial real estate. Learn more at his blog Filled to the Brim. We connect, cultivate and celebrate Orlando Entrepreneurs. Get Started. see what we are up to. Our mission is to advance Orlando entrepreneurs, their companies & our local economy.